Few divisions in the British Army have earned such a valorous reputation so quickly as the Parachute Division. Known as the Red Devils by the Germans for their trademark maroon beret and dogged fighting ability, the British airborne grew into a force to be reckoned with, whether delivered by Dakota aircraft, Horsa glider or as front line shock troops. Enough plastic components to make 30 British or Polish Airborne miniatures. Includes a host of options to allow for different weapon configurations and command models. Plenty of equipment including: Lee Enfield rifle, Mk V Sten Gun, Bren gun LMG, scoped Lee Enfield rifle, PIAT, Webley pistol, Mills Bomb hand grenades. This set also allows for Polish airborne troops to be built – their larger grey berets being a distinctive difference to their British counterparts. Although comparatively lightly-armed, British Paras could dish it out and would not hesitate to close to hand-to-hand fighting if needs be. 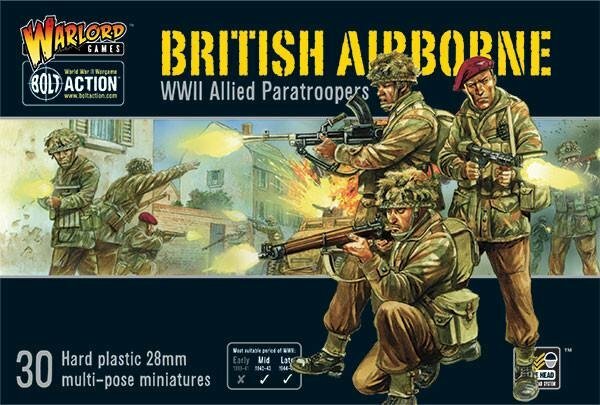 Warlord Games’ British Airborne are ideal for fighting in North West Europe where they could be used to re-fight actions such as the assault on the Merville battery, the coup de main attack on Pegasus Bridge, the heroic battles of Operation Market garden or onward to the crossing of the Rhine and Operation Varsity.